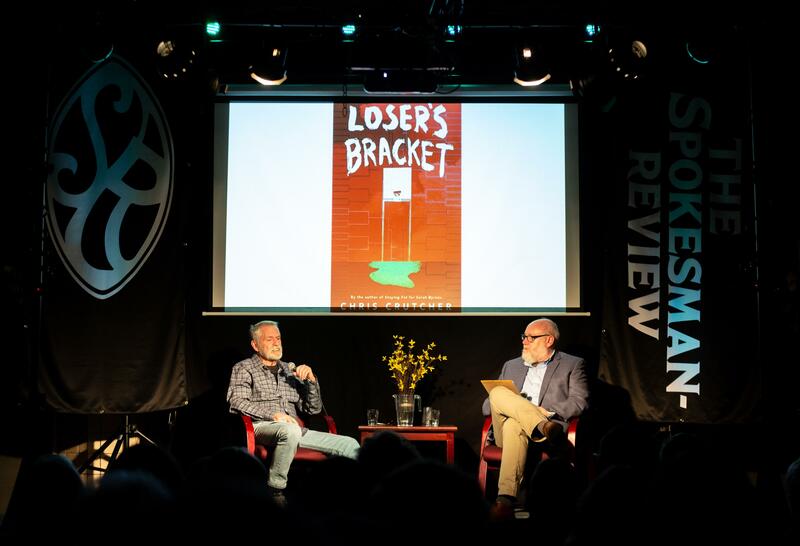 UPDATED: Thu., Jan. 17, 2019, 2:03 p.m.
Chris Crutcher is hoping his newest book, “Losers Bracket,” will be banned somewhere. He won’t be happy if it doesn’t get banned, he said. It would be the first of his 15 young adult books to avoid such restrictions. The retired therapist and author of young adult literature takes being banned with a sense of pride. To his mind, the words that make some parents and teachers reel back are exactly what young adults need to hear to grow, to understand and to discover truths in the world. Talking about the rough sides of adolescence targets and offers catharsis to “those things that make these kids ache,” he said. That was one of the lessons that Crutcher imparted during The Spokesman-Review’s Northwest Passages Book Club on Wednesday night. The event was attended by about 300 people, and moderated by Spokesman-Review columnist Shawn Vestal. Crutcher, who worked as a therapist and taught at an alternative school in Oakland for 10 years, uses his experiences in writing young adult books, but also in coaching young people through traumatic events. That work has spanned multiple school shootings: In the wake of tragedies like those at Marjory Stoneman Douglas and Freeman high schools, Crutcher arrived to “be a witness,” to aid in the process of healing, he said. Listen to “Award-winning author Chris Crutcher speaks with Shawn Vestal” on Spreaker. “Losers Bracket” follows the story of Annie Boots, a soon-to-be high school graduate who’s been in and out of the foster care system. The only way she can spend time with her highly dysfunctional biological parents is in public, during Spokane’s Hoopfest. And to squeeze the most time out of those moments, she always purposefully loses her first game to land in the losers bracket, where she’s able to play more games and spend more time with her family. Crutcher said he often feels as though he’s a better author than a therapist. Sometimes, he said, he’ll get emails from young adults saying his book saved their life, and they’ll send him one of his lines that he can’t even remember, “a throwaway line,” as he calls it. “I don’t have a therapeutic piece of magic that beats that,” he said. “You’re letting the reader do the work that they should do,” and they do it with their imagination. Published: Jan. 17, 2019, midnight Updated: Jan. 17, 2019, 2:03 p.m.